Hell Yeah Hummers Demolishing Houses! I always figured demolition would be the best part of any property renovation project. But you know what they say; if a sledgehammer is good, a three-ton army truck is better. 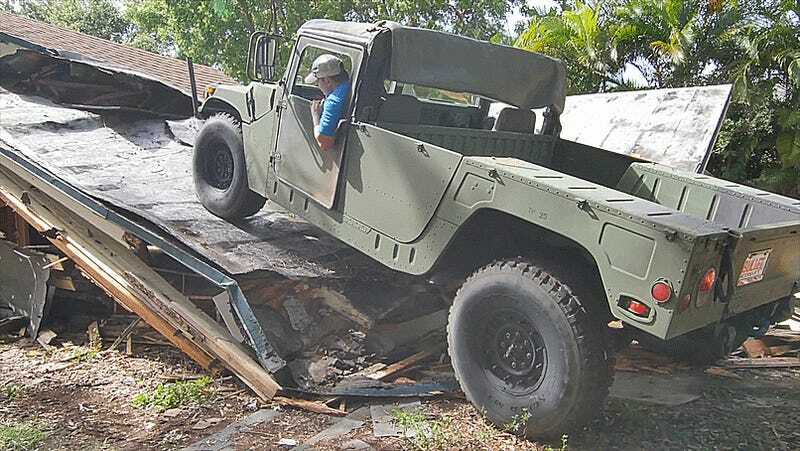 These vehicles belong to Bullet Motorsports, a dealership of interesting vehicles down in South Florida with quite a few military-spec HMMWV “Hummers” on the on the lot. Apparently street legal to boot! Though isn’t everything in Florida? Part of me still wants a Hummer, even though driving Doug’s was one of the worst automotive experiences of my life. But heck some of the these trucks are cheaper than Wranglers!